Once a stalled hotel project, the entire block of 10th avenue between 20th and 21st Street, aka 500 West 21st street, finally broke ground to lead toward the construction of a luxury condominium building. The developer, Sherwood equities, known for being very meticulous in their approach, was able to snap the construction site from the Hotelier Andre Balazs and investor Charles Baichman for $23.5M in 2010, half the price these two paid for the side in 2008. The proximity to the High Line and the evolution of the neighborhood as a more family-friendly area has led this 32 units building to offer larger apartments, many said to be over 4,000sqft. The apartment mix should consist of 12 two-bedrooms, 13 three-bedrooms and 4 four-bedroom, with 2 penthouses and 2 duplexes. The architect Ms Atkin mentioned that 65% of the units will feature either a terrace or a balcony, and most of them will have 2 exposures, and command views of the Empire State Building and the High Line. Thanks to the zoning, which aimed at preserving West Chelsea’s landscape, the building will be no higher than 80 feet, and blend well with the area by reflecting its industrial character, respecting the stately Romanesque Church and Seminary Row along the 20th street side. The interior design was handed to Mark Zeff whose focus is to give a “luxurious industrial” quality to the property to balance with the contemporary classic feel of the layouts and building design. To that extend, he is “planning to run a thread of oil-rubbed bronze from an exterior canopy throughout the public spaces and even into some areas within units”. 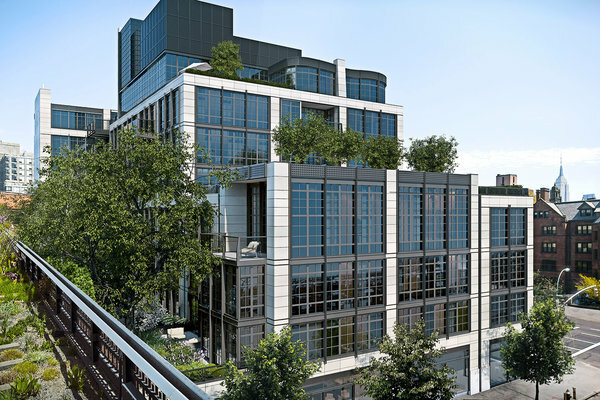 Finally, on top of the gym, playroom and meeting room, the project will feature a garden of mature trees on the second level of the building that will act as a screen from those passing on the High Line. Residents at this level will enjoy private terraces extending into the foliage.